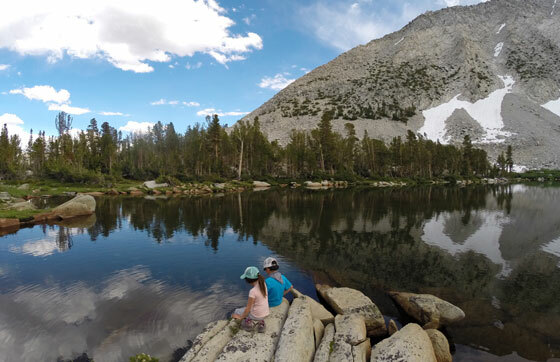 Ralph DeFelice, aka Adventure Dad, takes his son and daughter (ages 11 and 8) out into the wild as much as possible. 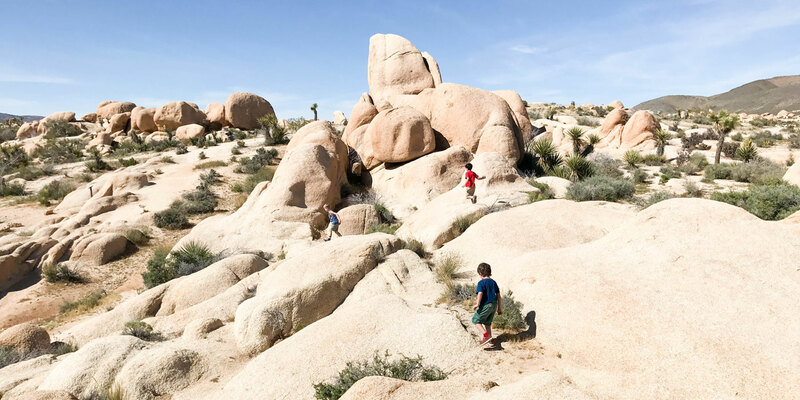 A single dad living in LA, he documents their outdoor adventures on Instagram (@daytripsla) and does his utmost to encourage other parents to get their kids up and out into the great outdoors. My childhood was filled with outdoor adventures—camping, hiking, fishing—experiences that have shaped who I am today. 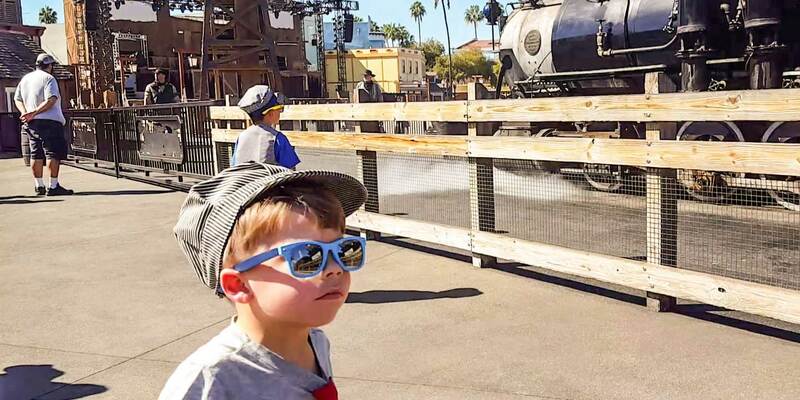 I have set out to give my own children the same kind of experiences, the best I can as a single dad living in the sprawling city of Los Angeles. The kids and I have spent the last four years exploring California. Day trips, road trips, hiking and camping along the coast, in deserts, and up in the mountains. Scorching heat, freezing cold, blue skies, pouring rain, blinding snow—we've seen a lot. Although we have escaped the city a hundred times, our adventures have been mainly limited to places where everyone else can go as well—state and national forests and parks, public beaches, car camping sites, and popular hiking trails. As the kids have grown older (now 8 and 11), I've started to set our sights on bigger goals and more challenging adventures. This summer, I decided we were ready to tackle our first real backpacking camping trip in the Sierras. Our destination would be the Hilton Creek Lakes near Rock Creek Lake, close to Mammoth Lakes, California. Three days, two nights. It seemed like a close but challenging spot in an area we were generally familiar with. And there were fish to catch. It has been over 30 years since my last backpacking trip, an adventure with my family in Montana’s Bob Marshall Wilderness when I was about 15 years old. I remember we were flown into the area in a small propeller plane. 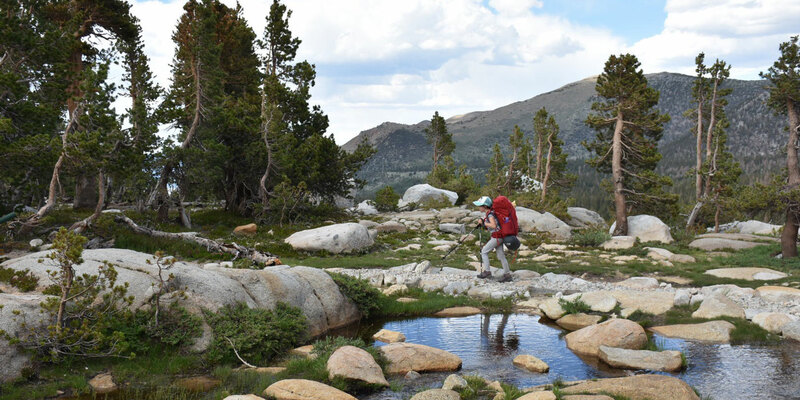 We landed in a primitive grassy airstrip cut out of the forest and jumped out with our packs and fishing rods. As the plane flew away, my dad checked the maps, and we started walking. I was in jeans and sneakers, carrying an external frame pack and a laughably giant sleeping bag. We caught trout along the way, drank from the Flathead River, and soaked in the sun, stars, and fresh air. Thirty five miles and ten days later, we emerged from the woods without having seen another person the entire time. It was this kind of unforgettable adventure I had in mind when I planned this summer's backpacking trip with my kids. Although we've accumulated a ton of gear over the years, I quickly realized almost none of it, aside from clothes and shoes, could be used on a backpacking trip. Our car camping gear was bulky and heavy, and we were missing many critical pieces, like a small stove, lightweight tent, a water filter pump, and…backpacks. The air mattress would have to stay at home on this trip. Shopping for new gear is one of my favorite things to do, and the kids have a blast, too. They ask again for knives, fire starting supplies, and obscure expensive tech. They love picking out freeze dried meals and trail snacks. But this summer, for the first time, I had some anxiety about packing for an adventure with the kids. My normal mode of packing is to throw everything we own into the truck and then figure it out when we get there. For this trip, I re-sorted all our gear, assessed the weight of everything, and ended up packing just a fraction of what we usually bring. I even told the kids they couldn’t bring a deck of cards because it was too heavy. I love to drive in Los Angeles…when I’m heading out of town. Loading up the car with kids, gear, and food brings me great joy. The kids sit quietly in the back seat on their iPads or asleep, with the excitement of a new adventure ahead of us. It’s a time of clarity and focus. My meditation time—the rare opportunity for me to think, plan, and reflect without interruption. The drive up the 395 is one of the most beautiful drives in the country, and for me it never gets old. Each time I notice something new, and make a plan to stop next time to investigate. On this trip, we spent our first night car camping near Lake Crowley at McGill Campground, a spot we’d stumbled upon months earlier. We set up camp, cooked, ate marshmallows, and talked about the adventure ahead. In the morning, we broke down camp and made our final decisions about what to load into our packs. A short drive later, we were at the trailhead ready to go. The excitement of the adventure dwindled quickly as the weight of the packs pressed down on the kids. A half mile in, the questions about how far we’d come and how far was left began. I carried a paper topographic map that we checked frequently. We also carried a handheld GPS that tracked our speed (a blistering pace of 1 mph) and altitude, and could be used to send an SOS if we got in trouble. After a 4.5 hour crawl, we arrived at the base of Hilton Lake #3 and headed up the final steep stretch of switchbacks. When we made it to the top (about 10,300 ft elevation), and saw the lake for the first time, my daughter was in tears, and we all were more than ready to take a load off and rest. After walking around the lake, we settled on a flat spot near the lake outlet and nearby waterfall to establish our camp. We soaked our swollen feet in the bone-cracking cold water, then set up our brand new tent for the first time, and made an early dinner. As we ate, we watched the trout feeding on the surface of the mirror-smooth crystal clear lake. We spent the late afternoon collecting water, arranging gear, exploring, fishing, relaxing, swatting mosquitoes, and applying DEET. When the usual afternoon rain clouds started to form, we retreated to our small tent and played word games. You know, name animals that start with A through Z in order. Aardvark, Bear, Cat…Then food, then places, then superheroes, then names, then “bad” words and a lot of giggling, then time to sleep. I was wishing we’d brought that deck of cards after all. After the moon set, I woke up to take photos of the stars. With no city light pollution nearby, the Milky Way cut across the sky from horizon to horizon. Stargazing is humbling and helps put things in perspective for me. 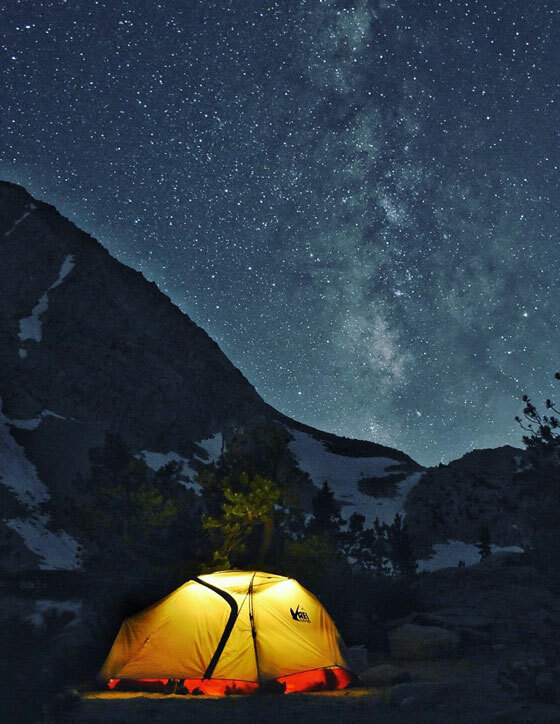 Staring up at the Milky Way reminds me of those Big Sky nights in Montana with my family when I was a kid. In the morning, we set out on a day hike to Lake #5 (there are 9 total). The kids were not happy about another 800 ft elevation gain, but the payoff was spectacular. A perfect mountain lake full of wild brook trout surrounded by a cathedral of snow-spotted granite mountains. We fished, talked, ate, and napped in the sun on warm flat rocks. The lake was ours. In 5 hours there, we saw one other person for about two minutes. Our second night was similar to the first. More freeze dried dinners, more mosquitoes, and more DEET. The kids were nervous about the hike out. I assured them that it would easier and go faster, and tried to convince them that their packs were lighter, even though they really weren’t. Our legs were still tired from the day before, but we picked up the pace and made better time heading down hill. About halfway back we ran out of snacks, but some fellow hikers stopped to share what they had when they saw us looking a bit burned out. Our first glimpse of the road was exciting for the kids, and they practically ran the last half mile. Our first stop was to get burgers and ice cream, and then we were off on the road back to Los Angeles. We should have done an easy one-nighter prior to this trip to work out the kinks in our gear. We were not physically prepared for the hike or the altitude. I had planned to train and practice more, but the summer in Los Angeles was so hot, we spent the weekends leading up to the trip on the beach, rather than hiking. We did not bring enough food. I was so concerned with carrying too much weight, and I underestimated how many calories we were burning on the hikes and running around during the day. I was hungry the entire time, and lost 6 lbs in 3 days. We did not drink enough fluids. The high altitude and dry air combined to dehydrate all of us on the hike up. I should have been better about encouraging the kids to drink more. We woke in the mornings with chapped lips and mild headaches. We brought too many cold weather clothes. I expected it to be cooler, and never really bothered to check the weather and temperature before packing. We need to find a solution for seating. We literally just sat in a circle in the dirt while eating our meals. We should have brought the dog. Everyone we saw had a dog except for us. This trip made me realize that we were actually missing a true sense of accomplishment from many of our previous adventures. On this trip, we set a goal, we worked hard, we took risks, we struggled, we overcame. We went somewhere under our own power and then returned. We were in it together. Afterward, the kids talked about what we did, instead of where we went. It was a small but significant achievement, and an important first step in building our confidence that we can do this, that we can push even further on the next adventure, and the next adventure after that. I cannot wait to see what we are doing a few years from now when we are all stronger and more experienced. Getting my kids outside has been a driving force in our lives the past few years. In my mind, maintaining a child’s connection with nature is a fundamental responsibility of parenting. And it's no small task—providing kids with unstructured free time in the wild takes planning and commitment. It might seem strange to make a huge effort to go on an adventure only to get there and do "nothing," but I’ve found that boredom leads to creativity and exploration. I intentionally put the kids in situations to get “bored” and then let them work through it. To truly adventure with kids, I think you have to be comfortable with risk and uncertainty and the prospect of failure—and bloodthirsty mosquitoes. You have to be okay with saying no to some birthday parties and soccer games, and making decisions that don’t conform with societal norms. There are sacrifices and struggles, and sometimes a little fear. But it’s all worth it. 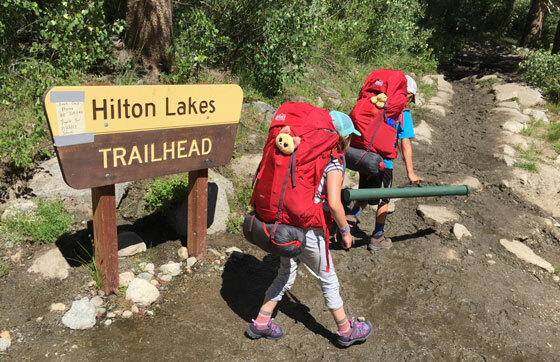 My kids will never forget their first backpacking trip. And they're already asking to go on the next one.